Have you explored using hyperdocs in your classroom? I hadn’t either, until I attended the CUE Conference in Palm Springs, California. The CUE Conference is the largest (this year topped 7,000 attendees) and oldest (35 years and still going strong) conference for educators interested in using technology to make a positive impact in their classrooms and the world. And it’s a great reason to go to Palm Springs in March! Click here to see the 2016 program. Since adopting Chromebooks in the classroom two years ago, I’ve been on a quest to learn as much about integrating them into my middle school English and AVID curriculum. At this point I’ve mastered the basics, and I’ve seen the magic that can happen when an entire class is fully engaged with tech. As a result, my mission at the CUE conference was to learn from other teachers who are ahead of me in the incorporation of tech, and find sessions that were as authentic and reproducible as possible. The most impactful session I attended was Lisa Highfill’s “HyperDocs: Engage, Educate, and Inspire with Transformative Digital Lessons”. I should have clued in when she was listed as a Spotlight speaker! According to her bio, “Lisa Highfill, co-creator of HyperDocs, is the TK-12 Instructional Technology Coach for Pleasanton Unified School District and the 2014 Teacher of the Year. She has presented at numerous conferences across the country, sharing ideas to improve the way students experience learning. Highfill is a Google Certified Innovator, YouTube Star Teacher, and a Krause Center for Innovation Merit Fellow. She is a self-proclaimed #BBQWhisperer and #VideoWhisperer.” You can visit her website at https://sites.google.com/site/lisahighfill/. Every single second of her presentation was magic. It turns out that hyperdocs are a 21st-century style worksheet – but instead of kids passively responding on paper, they must engage with hyperlinks the teacher has chosen and embedded on a shared Google Doc, Google Slide or other interactive formats. Hyperdocs can be used in any subject area for a wide range of purposes. Lisa shares “5 Ways to Package Hyperdocs” here for teachers to generate ideas, or to simply copy and adapt hers. Click here for a link to a presentation about “What Is Place” using Google slides. She uses Google Docs to create a hyper doc for a ‘fantasy book club’ here. Inspired and excited, I decided to create my own hyperdoc to help build schema before my 8th-grade students launched into reading Roll of Thunder, Hear My Cry. To understand the novel, it is crucial that students connect to the historical time period. All year we’ve talked about the ‘other’, and how groups are marginalized in society. We’ve discussed ‘separate but equal’ and my students are well versed on bias and social justice. But I knew that I needed to go deeper – to give them opportunities to connect, to hear the author’s personal story, to see images of the Reconstruction period and to explore racial stereotyping based on skin color. I titled the left column ‘Multimedia text set’ and the right column “Makes me think/new learning/response”. I then started to add the hyperlinks to the left column, making a new row with each one. When I finished, I shared the doc with my class via Hapara (if you have Google Classroom, that works too). I used a separate version for each period, so I would only have 35 students working on each doc at a time rather than all 115 on one. In class, my students opened the doc and could click on the hyperlinks in any order. The only requirements were that they must respond to each link, they must watch/read/view all links by the end of the week, and they could not modify/delete the links or change anyone else’s response. I encouraged them to customize with their own font and font color – just not to change the font size. I projected the doc at all times to monitor their responses, and I can report that not ONE student behaved inappropriately. For five days, we worked on the doc between 15-20 minutes/day. I was absolutely amazed. There was full engagement in my class. There were high-level discussions about what they were discovering, and there were tremendously elaborate and thoughtful written responses. One particularly impactful element of this hyperdoc was the TED talk link to Angelica Dass’s “The Beauty of Human Skin In Every Color”. My students watched in complete absorption as she explained her experiment on skin color and the dangers of grouping. Here’s some of what they said:Hearing Angelica Doss speak about color and how she is perceived made me think a lot more about how stereotypes play a big role still in our society. It was a very powerful talk. Humanae’s images really made me think about how I defined myself and how people define me as a person or what racial group they put me in. -Hearing Angelica Doss speak about color and how she is perceived made me think a lot more about how stereotypes play a big role still in our society. It was a very powerful talk. Humanae’s images really made me think about how I defined myself and how people define me as a person or what racial group they put me in. -The talk was very interesting. I am white so I have not had much discrimination. I do though think it is great because it seems like Humanae helps people in ways I will never be able to understand or in ways I just don’t understand right now. By the end, each period wrote about 43 pages of responses, some students reading what others had written and connecting their ideas with their classmates. 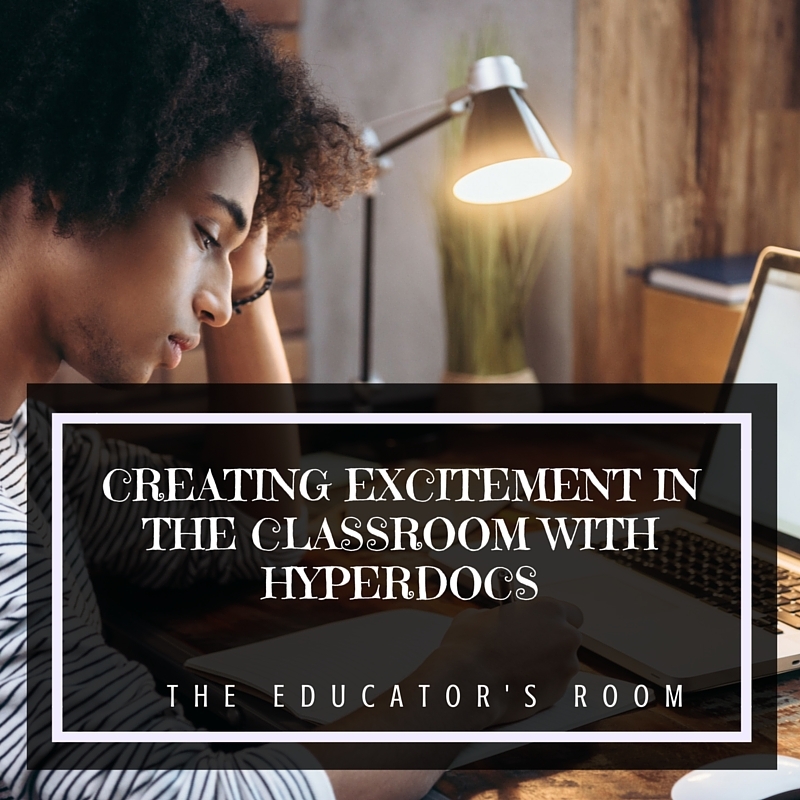 Using hyperdocs in my classroom created an excitement level that was contagious, and allowed me the flexibility to sit and talk with kids about what they were seeing and thinking as they were experiencing it. I’d love to share our hyper docs to learn from each other. Lisa created a Twitter handle https://twitter.com/TsGiveTs (Teachers Give Teachers) to help facilitate collaboration. Have you ever tried using Doctopus within Google Classroom? This way you can share your assessment of the students writing in detail and have a spreadsheet of your findings all at the same time.